Three times in the last 2 million years, the Yellowstone region has erupted in explosions that would have made the 1980 Mt. St. Helens eruption in Washington state look like child’s play. The resulting craters are known to geologists as calderas. The most recent of these eruptions occurred about 639,000 years ago, creating what is now called the Yellowstone Caldera, which extends over an area of about 30 by 45 miles (48 by 72 kilometers). 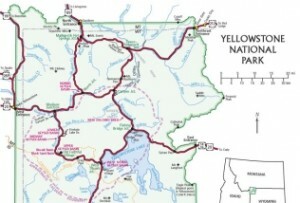 The approximate boundary of this caldera is shown as a pink dashed line on the Park Map. You may wonder why you don’t see a crater when you visit the area, if the caldera is so huge. Had we been there at the time of that eruption, we would have seen the vast hole. Over the hundreds of thousands of years since then, however, great quantities of lava oozed to the surface and flowed out to fill most of the caldera. Both the earlier ash (also called tephra) and the lava have long since hardened into rock. 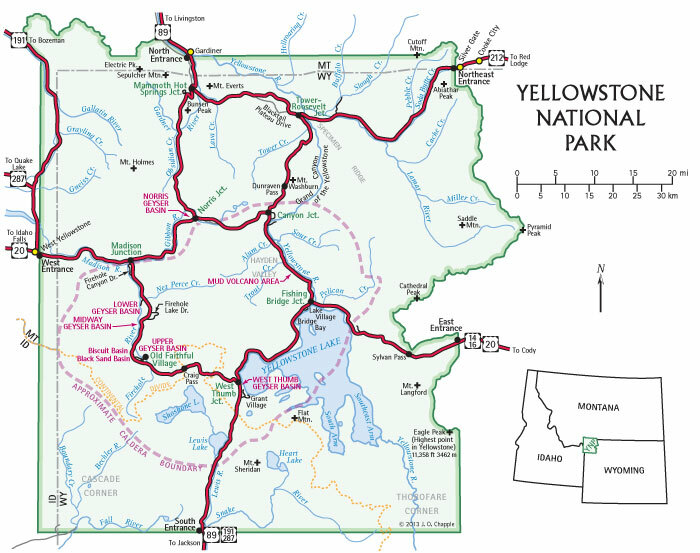 When you go to Yellowstone Park, you may notice that the entire central portion has no high mountain peaks rising above the forests and lakes. That’s because the lava flows filled the caldera to about what we see today. Geologists warn us that this extremely hot area could erupt again. My advice is not to stay away because of that. We’ll almost certainly be warned long before that happens—and it may be 100,000 years from now! ON THIS WEBSITE: See the Supervolcano nugget to find out more about the past eruptions and whether it could erupt again. IN THE GUIDEBOOK: Read more about the caldera events in the Geological History chapter of Yellowstone Treasures, pages 302–18. Copyright Janet Chapple. All Rights Reserved.